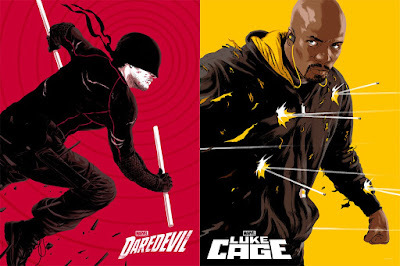 The minute The Blot saw Matthew Woodson's beautiful artwork for the Luke Cage, Daredevil and Jessica Jones vinyl soundtracks, I instantly hoped Mondo would also release it as a series of screen prints. I even made a plea to Woodson on Instagram! Thankfully Mondo had the same thought, and at a random time today, Wednesday, November 10th, they’ll be releasing this awesome poster set at the Mondo online store. These striking posters will look seriously amazing as a set on somebody's wall, don't you think!?! 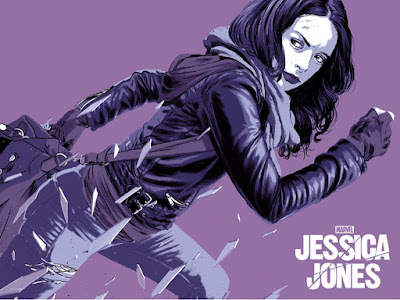 Daredevil and Luke Cage are 18”x24” hand numbered screen prints, while Jessica Jones is a 24”x18” hand numbered screen print. 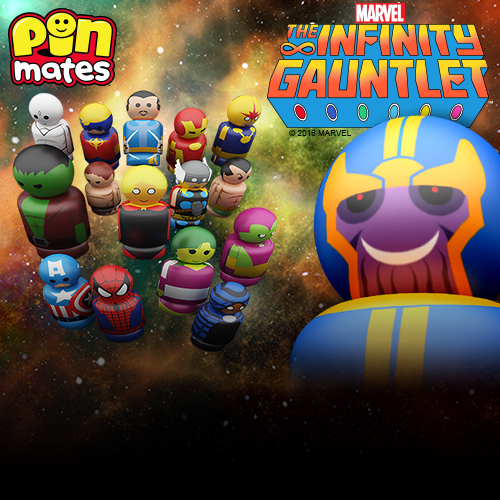 Each poster is limited to 250 pieces and will retail for $45. What’s even cooler, is that all three of The Defenders screen prints will feature a layer of spot varnish to bring different elements of the illustration to life.